On the evening of November 18, 1987 an inferno blasted through King’s Cross underground station, killing 31 people, and injuring and maiming three times that number. The causes were negligence and a discarded match. Two weeks ago, the BBC reunited people who were directly involved in the disaster including the then managing director of the underground Tony Ridley, and the Ghanaian musician Kwasi Afari Minta, who sustained devastating injuries from the fire, including the fusing of his fingers, and subsequently spent 25 years struggling to hold together his shattered life. At the end of the programme, the interviewer asks Minta how it feels to be sitting there. To hear the full programme, click here. 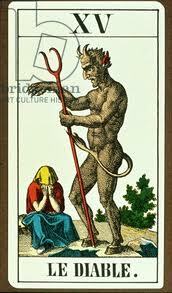 In traditional astrology, Saturn was the devil. But these days, we might be more inclined to pick Pluto, king of the underworld, as our Lord Voldemort. In fact, in the chart for the fire you can see that both are playing a role. Interestingly, Vesta, the goddess of the hearth, is conjunct Lilith, she of darkness, and trines Pluto-Mercury in the underworld of Scorpio. I would associate Vesta with safety, but also, obviously, with matches. This year for the first time since the catastrophe, Saturn finally reaches the spot where Pluto was on the day of the fire, down at 10° Scorpio. 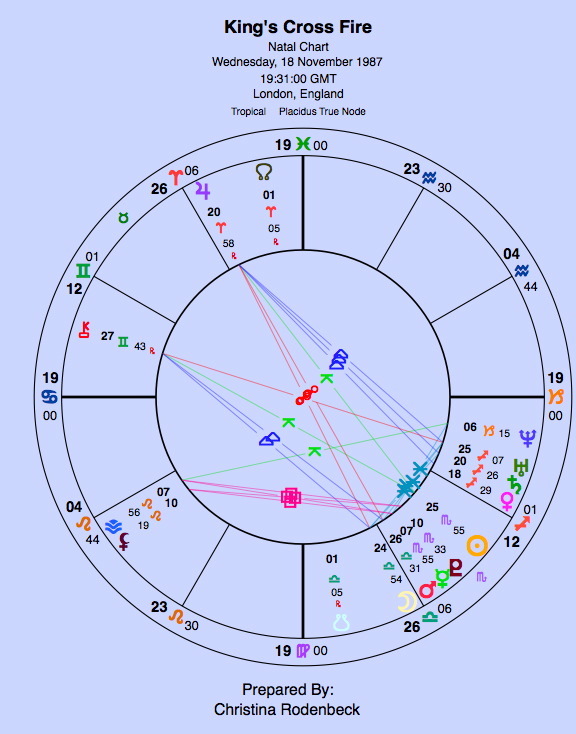 Transiting Pluto is also sextiling that point. The lunar eclipse that we just had was at 5° Scorpio. I’m writing this as transiting Mercury opposes the fire’s Moon. No wonder the subject of the fire has come up again. Mr Minta expressed the real point I wanted to make though – and he should know: bad things happen, and sometimes no one is really to blame. And no, those bad things are not always there to teach us something, or even help us evolve as individuals. Mr Minta’s life was wrecked. Maybe it would have been wrecked in another way — or maybe not. Collectively, however, we did learn something from that day. The underground is run along completely different lines today. For a start, there is no smoking. That particular kind of disaster would not happen again, but others might, others which are unforeseeable, over which we have no control, that strike seemingly out of the depths of Hades. Saturn and Pluto are currently in mutual reception, which will last until Saturn leaves Scorpio in a few years time. But right now they are also in sextile aspect – aiding and abetting each other. This will help us collectively to dig through the sins of the past and expose them, and also to listen closely to those susurrations in the underworld and try to distinguish what they are saying. Today on the news, another story about institutionalised child abuse over four decades was brought to light. Pluto and Saturn are pitiless. Thanks for posting this one, Christina. It was a very powerful programme and it’s still living with me. You post is illuminating that that old devil Saturn was involved. It makes perfect sense. And particularly poignant that the musician wasn’t eligible for compensation either. Saturn is as you say, pitiless. I’m sorry but for myself I am seeing – yet again – the tight contact between saturn and jupiter helped along by venus. I would say the carelesness was caused by venus to jupiter that caused something bad to happen saturn. I also notice the chiron mars contact. Career and fighting – fire-fighters anyone! theres is also the chiron uranus opposition. so fame and career maybe not in a good way as its an opposition. I can assure anyone from years of studying the interrelations of astrology and religion and after three books in the line (The Astrology of Beliefs, The Testament of the Magi and Christianity’s Destiny) that in any strictly religious contexts Saturn is the devil and he has two supplements in the asteroids, Lucifer (the devil as light) and Malin (Fr. Devil) which is the devil as darkness. But Pluto is not and never the devil. It is high time for working on religious issues that it was understood that Pluto is God as Creator/Judge but the God of Job who is experienced as terrible and who says, “No one may see me and live”. ( Ex 33:20). There are however again supplementary indicators via the asteroids and these are: Theotes (Godhead) and Bhagwat (Ssk. Lord). By contrast Neptune is Christ and Uranus is the Spirit. Christ(a) will work for the Christ of faith, Isa (Ar. Jesus) will work for the historical Jesus and Spirit can work for the Spirit. There is a secondary sense in which Pluto though not a devil symbol is or can seem like hell. Since everything exists through God, so does hell which can be called an experience of God, who is identified with fire (Ezek 1:27, Heb 12:29), as fire but negatively and in harmony with no other element to make the experience desirable. The hell supplements are Hell(a) and Orcus, the latter is more about hell as torment. I have recently been taken up with this subject. Before Easter the full moon fell on my Hella asteroid. I was unaware at the time, but that day on impulse I bought a modern translation of Dante’s Inferno. Though I have written poetry – I’ve had a whole poetic drama performed on the ABC here in Australia – I hadn’t written a line for 25 years. Suddenly it occurred to me I would experiment and attempt an update Dante’s aims for today using an alleged vision of 1995 of heaven and hell. Despite all the questions I and any might have about this vision, the pattern for its time is of compelling interest which forbids easy dismissal. Look for the result – 2 Cantos, 100 Stanzas written over last Easter – which I will issue on my McCleary’s Alternatives Blog on May 15th. There is something uncanny about this. I see that my sun, recently hit almost to the minute by the last lunar eclipse, is the same degree as the nodes for the vision of 1995, while what works for my name (Rollandia – recall asteroids were originally recorded in female version) is on the same 5 degrees again in Dante’s natal chart. I don’t know quite what Inferno I bought into under a full moon hit but what I’ve been bringing up has something there for religion and astrology to think about. The astrology will be discussed in pros and cons of the vision which will follow after the poetry. The creative result of that full moon inferno will be out for the reading from some time next Sunday the 12th, not as stated in my last message and last Blog, on the 15th. I think it’s more appropriate, given an attempt to update Dante, to put it out with moon in the sign of his sun and in aspect to Jupiter (the journey)! Even if you won’t care for the poetry I think you should find discussion of the astro of the reported vision on which it’s based interesting and challenging.